Linda Buckmaster will read from her “hybrid memoir” Space Heart: a memoir in stages and talk about the process of writing it through 7-years and 5 revisions. Linda has lived within a block of Route 1 most of her life, growing up in “Space Coast” Florida during the Fifties and Sixties and being part of the back-to-the-land movement in Midcoast Maine in the Seventies. Space Heart: a memoir in stages is about the 1962 space program at Cape Canaveral. 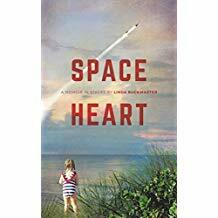 As the daughter of a rocket engineer, Linda weaves into her story the juxtaposition of cutting-edge technology and the natural world on the empty barrier island that came to be called the Space Coast. That contrast is written on her own small body as surgeons work to correct a congenital heart defect using materials developed for space flight. Linda will share stories from her book and will have some for sale. Search this database of more than 100 Maine library’s collection for title and author. Digital Maine Library replaces MARVEL! Read digital magazines on your computer or mobile device. You can get a Patron ID for the Bangor Public Library at the Liberty Library.